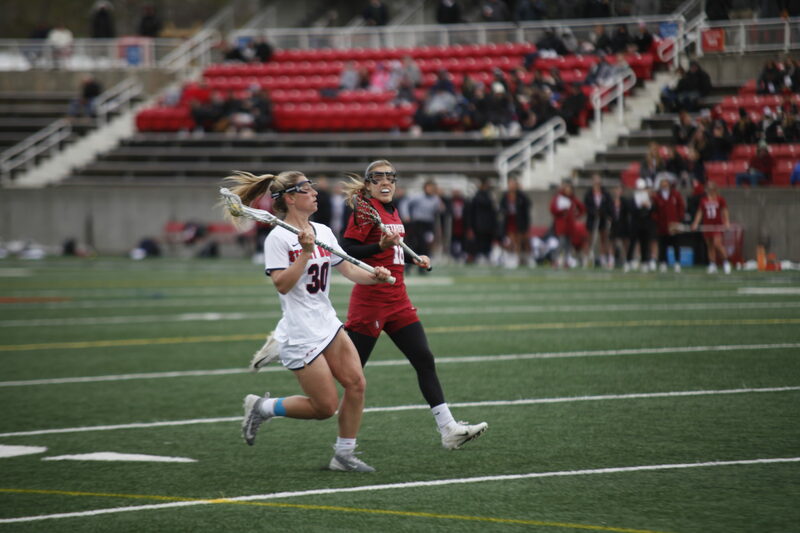 Following a 20-goal performance against UMass Lowell on March 30, Stony Brook Women’s Lacrosse returned with the same energy and intensity against Hartford in a 21-4 win on April 3. “It was a great opportunity for us to play a home game in front of a conference opponent and we were able to get every player on our team some meaningful minutes and some good playing time,” head coach Joe Spallina said. Due to injury, junior attacker Taryn Ohlmiller and senior attacker Nicole Baretta were the only two Stony Brook players who did not enter the game. The win was a true team effort, as the Seawolves had 15 different goal scorers and of their 21 goals, 14 were assisted. Stony Brook’s offense scored 17 of their goals in the first half and out-shot Hartford 30-2 in the half. Junior midfielder Ally Kennedy opened the team’s scoring with a free position goal less than three minutes into the game and followed it up shortly with a second goal. She finished the night with a game-high four goals, reaching 34 on the season. The Seawolves held an 11-0 run until Hawks sophomore attacker Megan Miller broke the team’s dry spell with her 18th goal of the year. Yet Hartford failed to score for the rest of the half and Stony Brook went into halftime on a 6-0 run. By halftime, the team’s stat sheet was filled. Senior attacker Sara Moeller had a game-high five points on two goals and three assists, while sophomore midfielder Siobhan Rafferty added two goals and sophomore attacker Bridget Considine scored once and had two assists. The second half was full of firsts. Stony Brook’s sideline erupted in cheers as freshmen midfielders Shonly Wallace and Nicole Rizzo and senior midfielder Carlee Janelli scored their first career goals. Freshman attacker Hailey Daleo and freshman midfielder Mikayla Dwyer also recorded assists for the first time. Defensively, the Seawolves were stellar. The team was a perfect 13-13 on clears and controlled 23 ground balls compared to Hartford’s 11. Hartford was limited to 16 shots on the game — 14 of which came in the second half — and freshman goalkeeper Gabrielle Cacciola recorded five saves. Senior midfielder/defender Mackenzie Burns paved the way with three caused turnovers, while Janelli, sophomore defender Haley Dillon and freshman defender Deanna Weisenburger each forced two. The team will put their perfect conference record on the line as they travel to face the University of Vermont on Saturday, April 6. Yet the message for the team is to simply continue playing well as a unit according to Spallina.